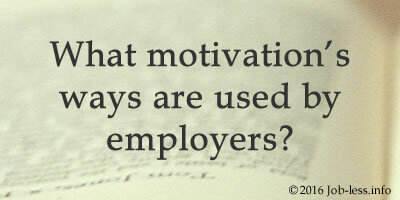 Article #9: What motivation's ways are used by employers? Your employer is equally skillfully charges inspiration new employee and seasoned old-timer? He probably owns the art of staff's motivation and knows exactly that rewards can be not only material. Here are some tricks which employers often resort to. What techniques of motivation aren't contemplated, financial incentive is a necessary but not sufficient condition for quality work fulfillment by subordinates. For creation of a favorable moral microclimate in team, employers resort as well to social and psychological kinds of motivation of members. As the most widespread we marked out the next non-material ways of motivation. The desire to gain confirmation of own work, adequate attention and respect for chief and colleagues is important both for novices and experienced staff. Every inducement from the boss - oral or written gratitude, the diploma, an award or publications in the press - simultaneously, is simple and important mode to appreciate the work fulfilled by the employee. Often in the companies there are clear and adopted remunerations for the done work. But the competent leader feels the subordinates and applies "casual awards", encouraging workers for non-standard or intermediate successes. Even if such award overtakes the worthy one at midst of an evening-party at the company, he will be unambiguously satisfied. Supporting the staff at the significant moments is a demonstration of well-wishing relations, and also, an element of social motivation, which will influence on further work. The consequence of feedback is obvious: It helps to share information about the everyday results of each worker, acting as a self-test and helps quickly identify new needs of employees. How exactly to build direct contacts with each subordinate in system and quickly to determine, for example, the need of any courses or training seminar, the leader decides independently. The practice of individual working conditions is important, taking into account peculiar properties of different types of temperament. So, conditions of strict regimentation facilitate greater efficiency of phlegmatic and melancholic persons, but affect vice versa sanguine and choleric people. In general, the issue of autonomy is very extensive. Employers stipulate alternative options of an operating mode, flexible working hours, a free choice of speed and a rhythm of work, an individual choice of duration of activity units' cycle and a set of other variations. For especially enterprising, responsible and ambitious employees, participation in management and career growth is really considerable. Otherwise such effective worker soon can be "lost". Encouragement to find a little bit of working hours on the day to employees' favorite activities increases their productivity significantly. After all most often workers don't have enough variety of occupation and possibility of changing job process. Existence of corporate culture, comfortable workspace, recreation room can help to solve partly this simple problem. People can show interest when are interested in them too. The experienced head always remembers it.